Year 11 Galen Catholic College student leader Macey Gillman will proudly lead the procession of schools in the 2018 ANZAC Day March. Macey was selected as this years Victorian State Flag bearer, a responsibility shared between Wangaratta’s schools each year. “It feels like a real honour to be leading the schools this year. I’m especially grateful for the opportunity, to show respect for all of the returned and deceased servicemen and women, and those presently serving our country,” Macey stated. Pictured above: Special invited guests at Galen’s ANZAC Day Assembly, from Wangaratta RSL Sub-Branch: Major. 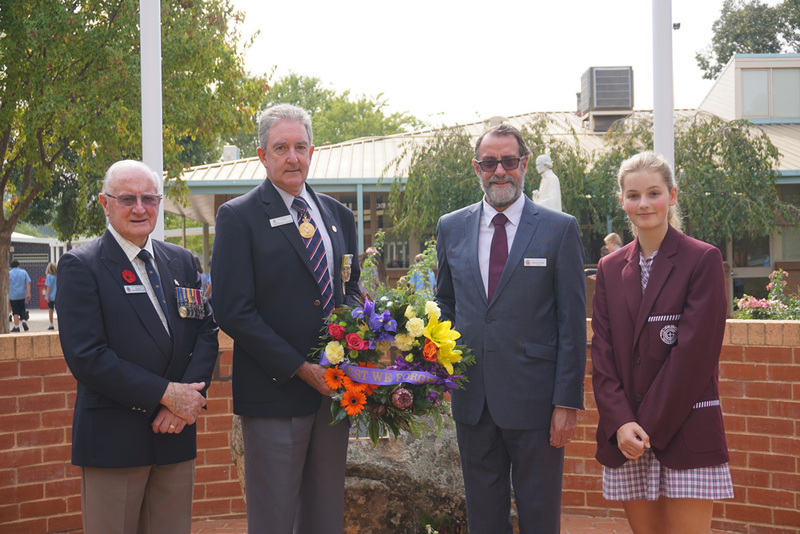 Arthur Bretherton OAM (Retd) Commemorative Events Coordinator, Lieutenant General Ash Power AO, SCS (Retd), Galen Catholic College Principal Bernard Neal and Year 11 student Macey Gillman, who will lead the schools procession, carrying the Victorian State Flag.